The Map to the right shows Redding California in the center indicated with the red star. 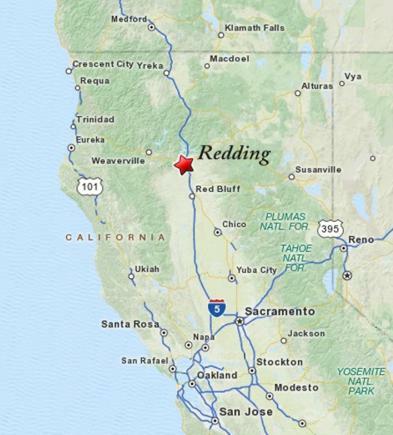 Between Sacramento and The Oregon border, a distance of approximately 300 miles Redding is the primary and largest city. We are at the very north end of the "Central Valley" of California that spans from Redding in the north to Bakersfield in the south. We are surrounded by Mountains on three sides with the valley to our south. Read more about Redding on this site on the Area Information page. This site; Redding-Real-Estate.com is intended to help people who are looking to find information about Redding California Real Estate including the surrounding communities of Cottonwood, Anderson, Bella Vista, Palo Cedro, Red Bluff, Shasta Lake, Old Shasta, Shingletown, Whitmore, Oak Run, Millville, Happy Valley, Lakehead, Lake California, and Real Estate in Shasta County. The site is designed and maintained by Realtor Eric Lewis in Redding California. The focus here is the inclusion of a large amount of images that relate to Real Estate, and that a picture tells a thousand words. Pictures and a lot of them is the idea, with more photos being added regularly. If you take your time to navigate the site you will see that Redding California is truly a great place, and I'm proud to call it home.